Relationship of terms is figured below. Society currently assumes a model of competition. As this changes to a model of efficiency, biological and work productivity can be optimized according to local potential and community management practices, leading to sustainability and social equity. 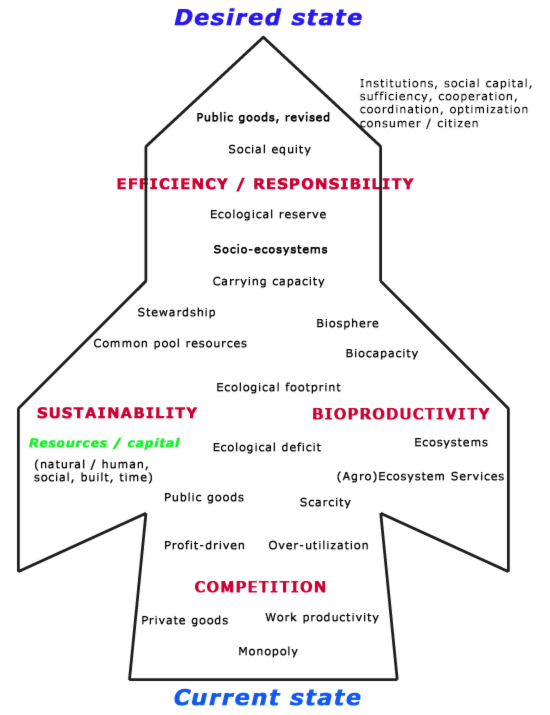 The competition model is profit-driven, increasing work productivity differentials between groups, increasing monopolies, leading to a conversion of public goods to private goods, and resulting in scarcity of basic resources for at least some communities in the present, with additional scarcity of resources coming in the future. Understanding the ways ecosystems (and all ecosystems together, the biosphere) function permits good management of common pool resources. This constitutes good stewardship of earth’s natural capital. Under bad management (or no management), over-utilization increases the human ecological footprint, and an ecological deficit results, leading to scarcity of resources and social inequity. Good management of common pool resources results in increased/optimized productivity and sustainability. Under good management, biocapacity and ecological reserves increase, and the ecosystem services remain adequate to manage human needs.